“We were arrested and charged with disorderly conduct,” Brooklyn Baptiste told Censored News. “Eight of the nine members were arrested,” Baptiste said of the Nez Perce Executive Council. “Most of us are out now,” Baptiste said at 10 am. 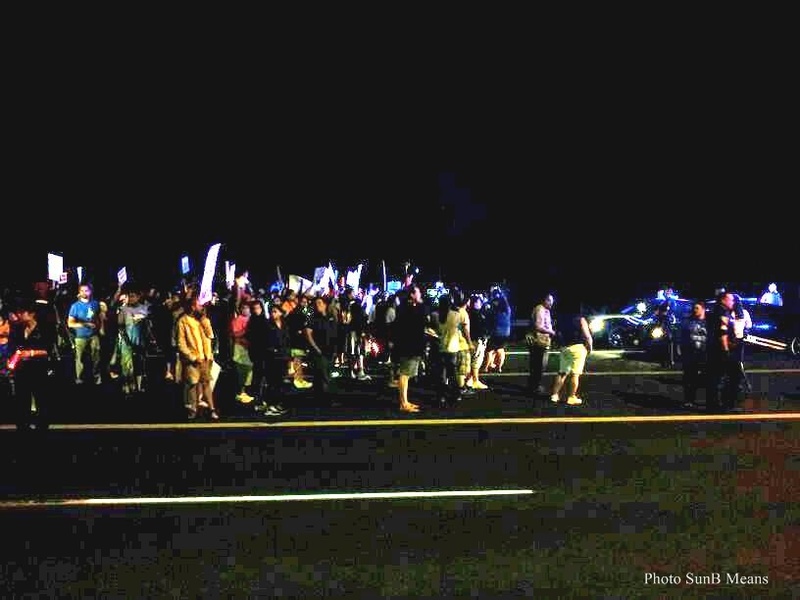 Nez Perce gathered before midnight at the border of the sovereign Nez Perce Nation to block the megaload approaching on the highway. 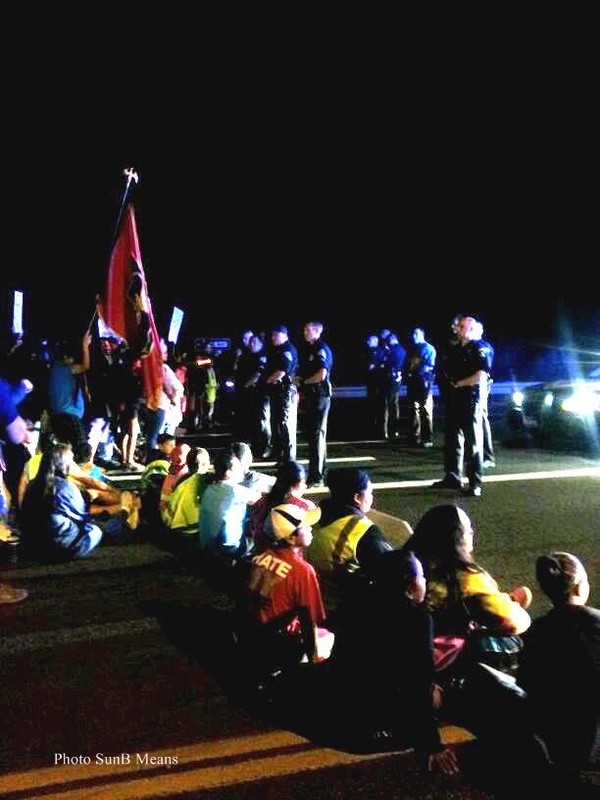 Singing the Flag Song, Nez Perce blocked the tarsands megaload before police and deputies removed blockaders and arrested Nez Perce leaders. The massive shipment of oil refinery equipment continued its trek along scenic U.S. 12 early Tuesday. The load departed the Port of Wilma, near Clarkston, Wash., shortly before 11 p.m. Monday, The Lewiston Tribune reported. The two-lane highway in Idaho passes through the Nez Perce reservation and a federally designated Wild and Scenic River corridor. Idaho issued a permit last week allowing Omega Morgan to begin hauling two giant water purification units, measuring 225 feet long, 21 feet wide and weighing 644,000 pounds, across the state, into Montana and on to the oil sands project in Alberta, Canada. “We are tired of being pushed,” Whitman said at a news conference at the Clearwater River Casino. This entry was posted in indigenous global activism, resistance under oppression, security state fascism. Bookmark the permalink. Here’s another article, gives some further details. indeed. a number of tribes are getting serious about fighting for their sovereign right now, many in canuckistan, of course. too often, at least in the states, for some tribal members, the powers they’re fighting are their own corrupt governments aligned with extractive business interests, though. like the navajo tribal council, arrgh. learned corruption and self interest from bia overlords early on. Tribal sovereignty is pretty important in northern New Mexico at least, though the pueblos have suffered past indignities to be sure. The pleasurable train ride from Albuquerque to Santa Fe crosses tribal land in several places. This had to be negotiated with the governments. We are always firmly advised by the conductor that photographs are not permissible and I have never seen anyone disobeying this. At the same time the tribes are most hospitable on their feast days as you know. Not to have obtained permission to pass through the Nez Perce lands with such enormous loads is hugely insulting to that community, not to mention a breach of their sovereignty. that has to be a great train ride, juliania. but you’ve reminded me of the time during debates when dubya was asked if he knew what ‘sovereignty’ meant (was it about tribes and water, etc.? )/ he just kept using different forms of the word in sentences, lol. had no clue whatsoever. another issue for tribes is that federal and state cops come onto tribal land to investigate, make arrests, etc. and that really irks some tribal councils. in this case, tribal police were also helping the other cops, reminding us of the days at pine ridge when dickie wilson’s GOON squads were helping to murder traditional lakotas. sick stuff. some (if not all) of the ute tribal council seems to have stolen the bulk of their members’ share of the pennies-on-the-dollar ‘settlement’ barack made over the indian trust account disappeared billions upon billions. and…so it continues to go in indian country.